C elebrated "wild ponies," actually stunted feral horses, ran loose over much of the Outer Banks until the late 1930s, when the General Assembly abolished free range north of Hatteras Inlet. Five herds of these "Banker" ponies survived by the early 2000s. Many have five lumbar vertebrae and 17 pairs of ribs, traits that frequently characterize Arabians, Barbaries, Andalusians, and descendants such as the Lipizzaner and the Spanish mustang but can occur in all breeds. Outer Banks horses are genetically closest to one another, the herd of Cumberland Island, Ga., and fairly recent American saddle and harness breeds. The Currituck Banks herd has a unique genetic marker, a fact that some enthusiasts, not taking into account the 300 years of local, systematic exploitation that would have affected the line, have taken as proof that the herd's ancestors came from a sixteenth-century Spanish ship. There have also been efforts, highly selective at best, to trace Banker horses to Ponce de León or the Lost Colony. However, because horses have been in North America for five centuries, discovering the specific roots of any of the Outer Banks' herds is very unlikely. Early settlers of the eastern seaboard tended to put their livestock on uninhabited islands, which required no fencing and usually had few large predators. Horses could have reached the Outer Banks anytime between the 1650s, when stockmen first came down from Virginia, and the early twentieth century, when summer visitors stopped bringing their own mounts. 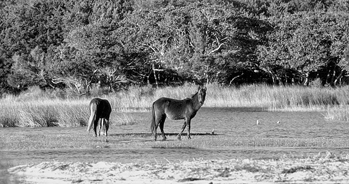 Cape Lookout National Seashore supports 100-odd horses on Shackleford Banks, where annual "pony pennings" were once a popular attraction. Around 1947 a local doctor released several Shackleford horses and others on Carrot Island, near Beaufort; harsh conditions and mercy killing have reduced this herd from 70 members in 1986 to fewer than 20. The Ocracoke herd had shrunk to about 100 by 1952, when the National Park Service acquired most of the island. Though Boy Scout Troop 290 became a mounted unit while it cared for several privately donated local horses, eventually the Cape Lookout Seashore bought most of these horses, having dispersed the rest of the herd. By 1974 only 10 remained, but veterinary care, supplemental feeding, and the ministrations of an Andalusian stud have brought the population back up to 27. Since the opening of N.C. 12 in 1984, the Currituck Banks herd, perhaps 60-100 individuals in several bands, has attracted its own tax-exempt support group and inspired a great deal of journalism, merchandising, and controversy. Because the Currituck National Wildlife Refuge excludes horses as nonwildlife, the herd wanders an increasingly crowded county "sanctuary" comprising developed and undeveloped private property. The tiny, probably related band that occupied Back Bay National Wildlife Refuge has been confined to private property in Virginia. Because of the small size of the horse populations, maintaining genetic diversity and protecting and preserving the herds are significant concerns. Exchanging fertile adults among the Outer Banks herds may reduce inbreeding, and state and federal aid as well as several foundations such as the Foundation for Shackleford Horses and the Corolla Wild Horse Fund seek to solve other problems plaguing the Banker horses. E. Gus Cothran, Genetic Analysis of the Feral Horse Populations of the Outer Banks (1993). Hope Ryden, America's Last Wild Horses (rev. ed., 1978). Ben B. Salter, Portsmouth Island Short Stories and History: Wild Horse Report (1992). 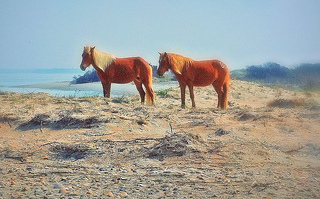 "Shackleford banks wild pony pair, Cape Lookout National Seashore, NC, 2012" Image courtesy of Flickr user Dennis Deitrick. Available from http://www.flickr.com/photos/deitrickd/7019218973/ (accessed July 19, 2012).